PHOTO CAPTIONS: 1. The motley crew hits the road, 2. 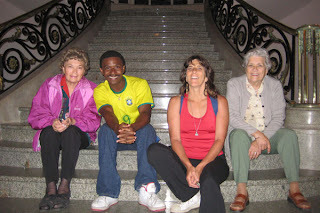 Andre and me with two Uruguayan señoras in the Argentine Hotel, 3. Gabriel and me in front of the Argentine Hotel at dusk, 4. Super Chelsea on the beach of Piriápolis, 5. Gabriel (left) riding the chair lift back down from Cerro San Antonio, 6. 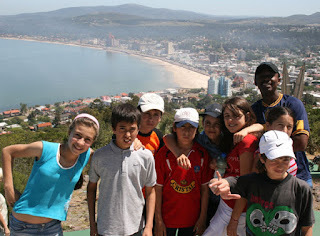 School kids pose with Andre at the hilltop, 7. 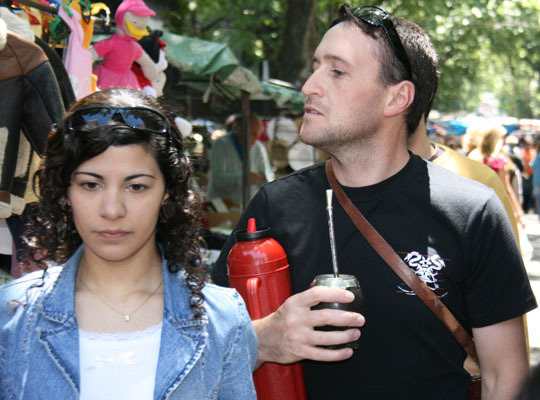 A typical Uruguayan walking with thermos under arm, drinking maté tea, 8. the cemetery in Minas, 9. 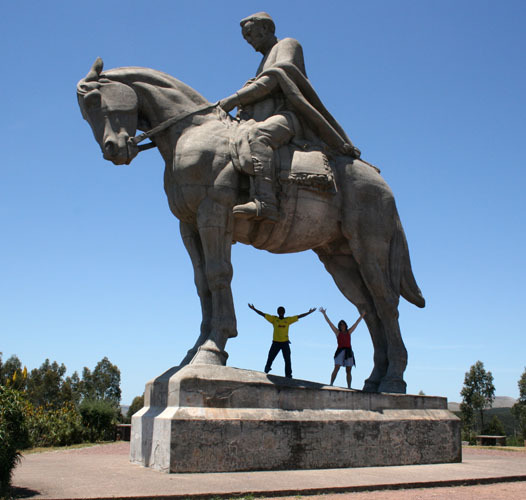 The world's largest horse statue, honoring General Jose Artigas, 10. Taking a dip at Salto del Penitente, 11. 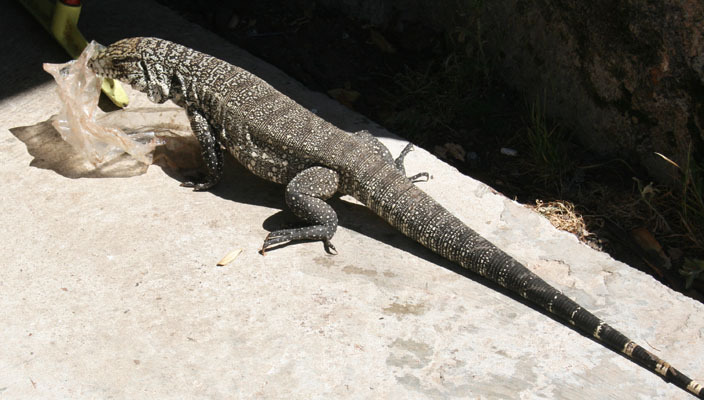 An iguana makes off with a plastic bag he scavenged from the trash at the falls, 12. Gabriel, our private photographer, got lots of pics of me and Andre, 13. Our Mexican feast prepared by Gabriel. 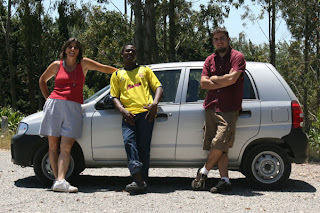 I rented a tiny Suzuki car in Montevideo and the three of us hit the road. We headed east, destination Piriápolis, about 100 kilometers away. Taking the scenic coastal route, we admired the nice beach houses, wondering how much they could cost in a country where minimum wage is about $243 a month (Haiti is $124. Source: wikipedia). The city of Piriápolis, with a permanent population of 8,000 (which swells to 30,000 during high season), is very charming and would fit right in on the Italian Riviera, with its lamp-lit ramblas, oceanfront hotels and sidewalk cafes. We met two sweet senior citizens from Montevideo, world travelers in their younger days. Like everyone else, they asked if we were Brazilians, but no, we're from Mexico, Haiti and California. 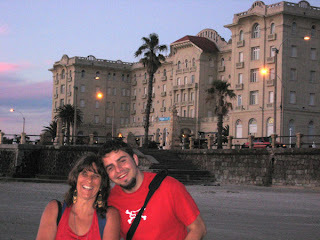 The two ladies were staying at the the elegant Argentine Hotel, built in 1915 and invited us in for a tour. Our hotel, though not as grandiose, had DSL in the rooms, included breakfast, and had secured parking for our faithful stead -- $52 total for a single and double right near the beach. The next day we took the chair lift up to Cerro San Antonio 493m (1617ft) above the town and beach. We were joined by a bus load of spirited fifth graders. The girls raced each other to the chapel of Saint Anthony to ask for boyfriends. And not just any boyfriends. They wanted rich, handsome, and perfect boyfriends. The boys were shyer to make requests, but one of them asked the saint for lots of money. Maybe he was hoping to win one of the girl's hearts in the future. The kids asked us to take pictures of them and a few were bold enough to want to snap a few themselves. After a huge lunch of grilled meats -- steak, kidneys, chicken, pork ribs and lamb -- we drove on to the resort city of Punto del Este, which according to Gabriel is the main beach resort for Argentina, Uruguay and western Brazil. As we approached, all I saw were high-rise hotels and condos and imagined it to be as uninteresting as Cancun or Waikiki. We parked our car at the yacht harbor and Gabriel led us on a nice walking tour of the point. He'd been there before with a friend from his village. That neighborhood was actually quite sweet, and seemed quite safe and quiet, with charming colonial-style homes. At the yacht harbor, we ran into another school group, this time they were excited about the sea lions (lobos marinos, which literally means "marine wolves"). They hang out under the wharf, just like in Santa Cruz, and again I was struck by how much I felt right at home in Uruguay. From Punto del Este we drove into the interior for an hour or two, arriving at the city of Minas, population 38,000, where we spent the night at Hotel Plaza. The friendly clerk gave us a map and helped us pick out the most interesting things to see the next day. In town, we started with the Casa de Cultura which was the birth home of General Jose Artigas, the George Washington of Uruguay. 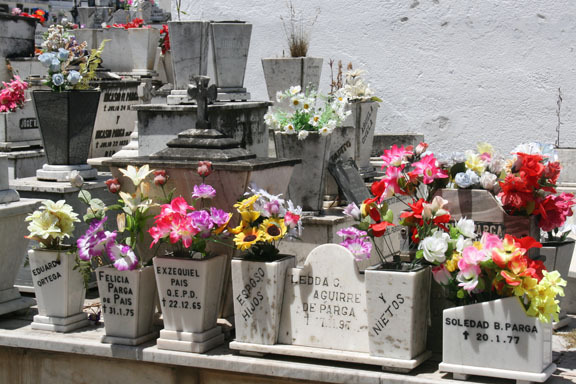 It was filled with wonderful mementos, such as his accordion, guitars, flutes, and a pump organ (quite a musician), as well as ponchos, gaucho hats, and of course his cup and metal straw for yerba maté tea, which every Uruguayan drinks as they walk around town. The cathedral was locked, so we went onto the Museo de Comicos/Teatro, one of only 7 cartoon museums in the world. The collection of original cartoons, mostly political, is so impressive that the country of Uruguay featured several of them in a postage series. The city doesn't charge for theater productions. In each museum we had a private guide, who either politely refused or humbly accepted our tips. I still can't get over how nice and hospitable everyone is. We walked back to our car, then drove out of town, stopping at a cemetery with beautiful silk flowers everywhere, then at the world's largest horse statue. 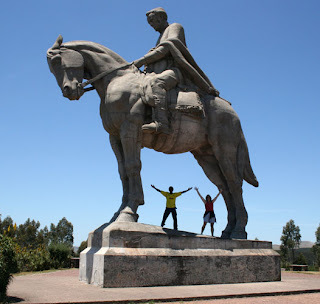 Of course the man was Artigas, the George Washington of Uruguay. We couldn't find the name of the horse. From there we went to el Salto del Penitente, a 180 ft. waterfall which appeared large in the brochures, but this time of year it was a mere trickle. Still, I couldn't resist a cool dip while Andre and Gabriel discussed the water quality, or lack of, guessing from the film on top that women must be washing clothes upstream with detergent. Regardless, I survived. 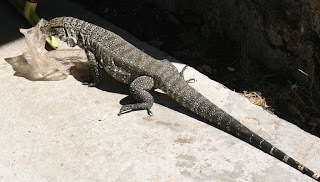 We tried to rescue an iguana from eating a scavenged plastic bag, but he ran off into the brush with his treasure. 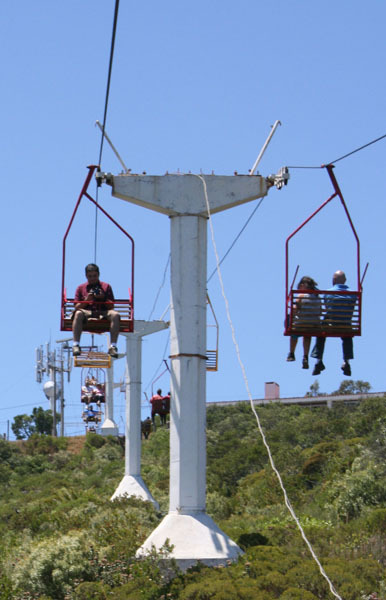 We were surprised to see zip lines across the deep gorge, but they're only open on the weekends. Supposedly lots of visitors trust the zip lines, but I wondered if I'd have the guts to do it even after watching others go first. Though Minas is a relatively small town, they have their own television station, lots of libraries and bookstores, and the school children all carry musical instruments. 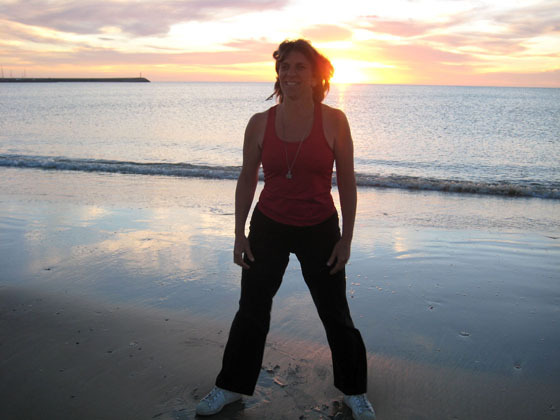 In other words, we all agreed that Uruguay may be considered a poorer country, but the people are rich in culture and seem quite content with their lives. Gabriel guessed that Mexico's proximity to the U.S. causes his paisanos (country-mates) to feel more deprived and jealous of the material wealth of us Americans. The people in Uruguay, as long as they have maté and dulce de leche (a carmel sauce they put on everything), seem quite happy. Whenever you say "gracias" to anyone, they enthusiastically reply, "no,no, por favor" as if you're doing them the favor. We enjoyed one last day in Montevideo, staying at Gabriel's apartment since his housemates were off to Iguazu Falls. 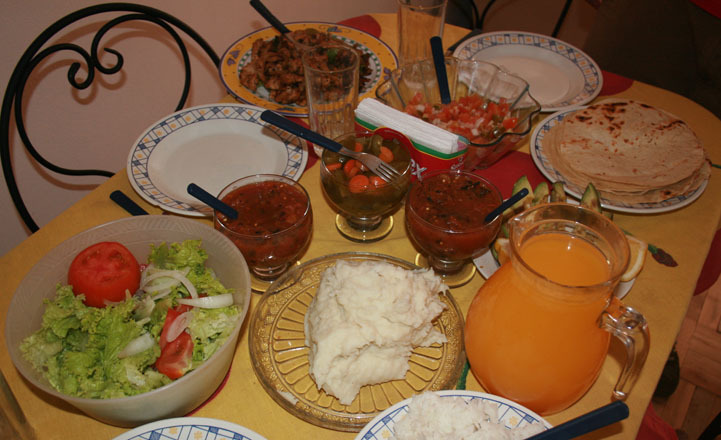 In celebration of our successful road trip, Gabriel prepared us a Mexican feast of chicken fajitas, two kinds of homemade salsas, flour tortillas from the Mexican fast food place we discovered together, rice, mashed potatoes, avocados, salad, fresh-squeezed orange juice and Mexican hot chocolate. Oh My Gosh! You look A-W-E-S-O-M-E! It is so good to see your smiling face - even if it's not here in Santa Cruz. What a great adventure, and the stories are great. That horse is just huge! (read HUGE!!!). I look forward to seeing you and Andre upon your return.